Bangladesh left-arm spinner Mohammad Rafique took a rare step into the limelight with six wickets as South Africa were dismissed for 330 on the second day of the second Test today. Mohammad Rafique (L) of Bangladesh celebrates after bowling South Africa's Paul Adams on the second day of the second Test in Dhaka on Friday. Darren Lehmann fell four runs short of another century as Australia continued to pile up a huge total on the second day of the third Test against West Indies today. The Sri Lankan bowlers have a plan to stop New Zealand skipper Stephen Fleming’s run-scoring spree, Hashan Tillakaratne said today. Preparing the ground for some meaningful discussions with India on resumption of cricket ties, the Pakistan Cricket Board today expressed its readiness to play India at neutral venues and also participate in the Asia Cup, provided New Delhi was willing to reciprocate. Cricket Bible Wisden has given full credit to captain Sourav Ganguly for transforming Indian team from “stoic losers to chest-thumping warriors” and helping it emerge as the “second-best” team in the World Cup. Vice-captain Rahul Dravid will make use of India’s prolonged break in its international engagements to play for Scotland in its debut season in England’s national league. Dravid, who is getting married on Sunday, will leave for Scotland by the end of this month. A sense of jubilation and an air of confidence prevails in the Tamil Nadu Ranji Trophy team, as they gear up for the climactic battle, the Ranji Trophy final against Mumbai, starting at the Wankhede Stadium from May 4. Yugoslavia's Jelena Dokic returns the ball to Spain's Magui Serna during their third round match at the Warsaw Cup WTA Tennis tournament on Friday. India’s ace rifle shooter Jaspal Rana has blamed the sports federations and coaches for an increase in the incidences of doping among sportsmen in the country. Expressing concern over the fact the laboratories of sports authority of India which conducted doping tests of players did not meet international standards he said it was the main reason why sportsmen who tested negative for doping in India were found positive abroad. Bishop Cotton School Shimla lifted the overall trophy at the third state inter school shooting chamionship organised at Lawrence School Sanawar today. The event attended by as many as eight schools from all over the state. The 32-year-old Rafique, playing in only his third test in three years, dismissed tail-enders Alan Dawson and Paul Adams to finish with six for 77, the best Test figures ever recorded by a Bangladesh bowler, after South Africa had resumed on 264 for six. The home side reached four without loss in reply before heavy rain, which delayed the start for more than two hours, washed out the rest of the day after an early tea. Just over 26 overs were bowled on Friday. Rafique, whose previous three Test wickets have cost 68.33 runs apiece, had Dawson caught behind for 10 off a sharply turning delivery and wrapped up the innings when he bowled Adams with a ball which beat the bat and hit the top of off-stump. Rafique’s victims on Thursday had included three of the top five batsmen, including Herschelle Gibbs. 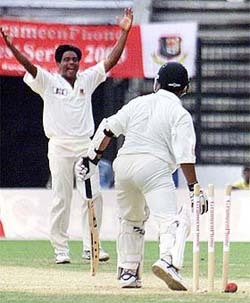 Only two other Bangladesh bowlers have ever taken six wickets in a Test innings. South Africa number eight Robin Peterson, however, ensured a respectable total as he scored 61 on his debut, batting for two-and-three-quarter hours as the lower order dug in on a pitch freshened up by the rain and already offering turn and inconsistent bounce. Peterson finally cut a googly from Mohammad Ashraful hard and low into the covers where Akram Khan held the sharp chance. South Africa’s last six batsmen scored 192, Shaun Pollock making 41, compared to the 115 contributed by the top five. The touring side had been reduced to 63 for four on the opening day before Jacques Rudolph and Mark Boucher, both with 71, engineered a fightback. After making an unbeaten double century on his debut in the first Test, the 21-year-old Rudolph now averages 293. South Africa won the first match of the two-Test series by an innings and 60 runs. Bangladesh have yet to win a Test, losing 17 out of their 18 matches. Ricky Ponting of Australia raises his bat after reaching his third Test century of the series during the first day of the third Test match against the West Indies at the Kensington Oval in Bridgetown, Barbados, on Thursday. Lehmann, who made his maiden Test century in Port of Spain two weeks ago, added seven to his overnight score before he was lbw to Vasbert Drakes for 96 in the second over of the morning. Captain Steve Waugh and Adam Gilchrist built steadily to help the tourists, 320 for three overnight, reach 409 for four at lunch. West Indies captain Brian Lara, who surprisingly sent Australia into bat after winning the toss on yesterday, missed the session with what appeared to be a bout of ‘flu. The session briefly came to life when Gilchrist hit a four and two sixes in successive balls off debutant fast bowler Tino Best. Gilchrist began by driving through square leg for four, hit the next ball over midwicket for a six and dispatched the following delivery in the same direction, this time even further. Gilchrist dished out more treatment to Omari Banks shortly afterwards, hitting another six over extra cover to reach 43 not out by lunch. 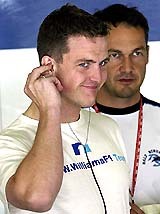 Waugh was unbeaten on 42. 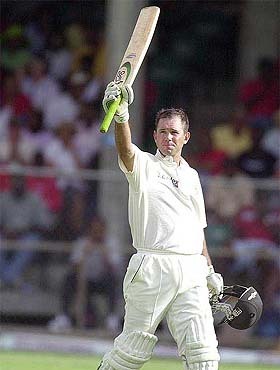 Ricky Ponting stroked his 17th Test century as Australian batsmen dominated the West Indies scoring 320 for three at stumps on the opening day. Vice-captain Ponting was run out for 113, his third century in successive Tests in this series, after the visitors were sent in to bat. West Indies captain Brian Lara surprisingly chose to bowl first after he won the toss, and nearly had immediate results. Ponting and Langer powered to lunch at 113 for two off just 24 overs, but the home team slowed progress after the break. FoW: 1-43, 2-151, 3-292, 4-331. “We’ve got a game plan against Fleming, we’ll see how it goes,” said Tillakaratne on the eve of the second and last cricket Test of the series here. 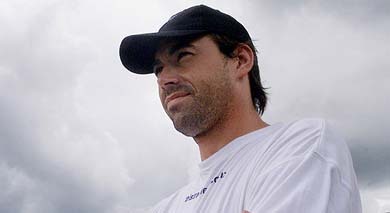 Fleming created a New Zealand record for most runs in a cricket Test when he scored 274 and 69 without being dismissed during the drawn series opener against at Colombo’s Saravannamuttu Stadium. His match aggregate of 343 eclipsed former skipper Martin Crowe’s 12-year-old record of 329 in a single Test. Crowe had scored 30 and 299 against Sri Lanka at Wellington in 1991. Coming in to bat at the fall of New Zealand’s first wicket after 45 minutes of play on the opening day, Fleming spent the remaining five days in the middle to thwart Sri Lanka’s ambitions of continuing a nine-Test winning streak on home soil. Fleming batted for 11 hours in the first innings and five in the second, beside plotting the fall of rival batsmen while he was fielding during Sri Lanka’s lone innings. Tillakaratne said Fleming’s big innings were not playing on the minds of the Sri Lankans, although he was concerned at the Black Caps’ skipper being given half a dozen chances through dropped catches. “Our fielding remains a big concern and (Colombo) could have been a different story had we taken those catches,” said Tillakaratne. “We could have got Fleming out early on the first day. PCB chairman Lt Gen Tauqir Zia said if India was interested in playing at neutral venues, Pakistan was willing to reverse its policy and agree to it. However, Pakistan would not tour India until India honours its tour commitments in Pakistan, he told the state television before leaving for an Asian Cricket Foundation meeting in Dubai tomorrow. Zia will use the occasion to hold talks with his Indian counterpart Jagmohan Dalmiya on the issue of resumption of the Indo-Pak cricket ties which have been under a freeze for the last three years. India has refused to play Pakistan in bilateral series accusing Islamabad of fomenting terrorism in the state of Jammu and Kashmir. Zia said if India was serious about resuming cricket ties, Pakistan was even willing to reconsider its decision not to participate in Asia Cup later this year. The decision to skip the Asian tournament was taken as a retaliatory step after India called off its trip to Pakistan scheduled after the World Cup in South Africa. Terming India as “A New Steel”, Wisden Cricketers’ Almanack 2003 said the “hub” of India’s transformation was Ganguly who “lifted Indian cricket from a state of factionlist torpor by the sheer force of his personality”. If Wisden was opulent in its praise of Sachin Tendulkar, who has been given a special space in its latest edition, it was no less praiseful of the Indian skipper for showing “passion, vim and an unflinching commitment to talent”. Referring to India’s loss in the World cup final, it said: “If they lost, it was because they lacked skill and armoury in foreign conditions, not nerve and heart. Indian skipper Saurav Ganguly dreams to play 100 Test matches for the country, wishing to reach the magic figure in a few more years. “I wish I could carry on for a few more years. My goal is to turn out in 100 Test matches,” Ganguly, who has played 67 Test matches and scored more than 4,000 runs, said at a felicitation function here. The informal function, a ‘pleasant evening with Saurav Ganguly’, was organised by the Cricket Association of Bengal to honour the Indian skipper for the way he led the national squad to the World Cup final in South Africa earlier this year. Ganguly, visibly moved by the presence of a large number of present and former Ranji cricketers of Bengal, took the opportunity to thank all those who supported him since his teen days when he set his nervous first foot at the Eden Gardens, the venue of the programme. Describing himself as a ‘lucky man’ for having played a large number of Tests for India, Ganguly said, “All cricketers give their best to the game. But all are not lucky to play for India”. Addressing the budding cricketers of the state, Ganguly said they should work hard and not lose hope even if they fail to make it to the big stage. “Keep working hard. Believe in yourself. And you will succeed,” he said. Turning to his Ranji Trophy team mates, Ganguly admitted that he could not turn up regularly for the state side due to his hectic national commitments. “But I keenly follow their fortunes,” the ‘Prince of Kolkata’ said, hoping that the Bengal side, which put up a dismal show in the Ranji trophy this year, would succeed in improving their performance next year. Eulogising Ganguly, BCCI and CAB president Jagmohan Dalmiya retraced the current Indian captain’s early playing, recalling his Ranji Trophy debut in the tournament final of 1989. Mr Dalmiya said Ganguly, who was selected for the tour Down Under in 1992 in a tri-series also involving West Indies, got a raw deal, getting picked in the final XI in only one match against the Caribbeans. “For reasons unknown, he played in only that match, against the fearsome pace battery comprising the likes of Curtley Ambrose and Malcolm Marshall,” he said. Vice-captain Rahul Dravid will make use of India’s prolonged break in its international engagements to play for Scotland in its debut season in England’s national league. Dravid, who is getting married on Sunday, will leave for Scotland by the end of this month for a three-month stint with the Scottish national team which is trying for a berth in the 2007 World Cup. “I am looking forward to this opportunity of playing in Scotland. It will help me stay in touch with the game through the off-season, without too much cricket,” Dravid said. This is a very good chance for the young team to bring home the trophy, agree TNCA Secretary C R Vijayaraghavan, selector and former captain V B Chandrasekhar and two other former captains W.V. Raman and Robin Singh. Tamil Nadu made it to the summit clash last under the captaincy of Raman in 1995-96, but failed to regain the Cup. The team is already on a high, emboldened by the absence of the ‘greatest bat of this era’ Sachin Tendulkar from the Mumbai side, who is away in the USA for surgery on his injured left ring finger. Tamil Nadu have not forgotten how Tendulkar bulldozed them out of the tournament, in the knock-out phase with a brilliant unbeaten century, when the two teams had met in the 2000 season. His absence is a morale booster for the Tamil Nadu team. Last season, they had outplayed Mumbai minus Tendulkar in the pre-quarters here. ‘’The boys should make best use of his absence,’’ says Mr Vijayaraghavan. It will be quite an achievement for the new captain S Suresh, if his team, which left for Mumbai last evening amidst high hopes, outplays the 34-time champions in their own den, the Wankhede Stadium. The state last won the title in 1987. Even prior to that, Tamil Nadu had always been considered a leading force in Indian cricket, having thrown up many a talent like M J. Gopalan, C.R. Rangachari, C.D. Gopinath, A.G. Kripal Singh, V.V. Kumar, S. Venkataraghavan, K. Srikkanth, W.V. Raman and Robin Singh. Lesser lights like stumper Bharath Reddy and batsman T.E. Srinivasan, had represented the state with distinction. The state, then known as Madras, had etched the name on the glittering cup first time in 1954 under the stewardship of the late Balu Alaganan. After the 1987 win over the formidable Railways at the M.A. Chidambaram Stadium in the title round, Tamil Nadu have faltered at the last hurdle twice — in the 1991-92 season against Delhi at the Ferozeshah Kotla, and in the 1995-96 season against Karnataka at the M A Chidambaram Stadium. The state would particularly rue their losses in the final of the 1967-68 and the 1969-70 seasons, having lost from winning positions on both occasions. “The ‘Sachin factor’ helps because the Mumbai team is not what it can be with Sachin playing,’’ feels Raman, who had led the team to the finals in 1991-92 and in 1995-96. The former India opener also opines that the present team is capable of defeating Mumbai and fulfilling Tamil Nadu’s dream of winning the Ranji Trophy again, after 1987. “The victory against Delhi in the semifinals has given the team a lot of confidence,’’ he observes, adding that there was talent and it has been shown on the field. Robin Singh is also elated over the team making it to the final. The former India all-rounder, who opted out of the Tamil Nadu team this season, paving the way for Suresh to take over, says the teams are evenly matched. ‘’We are a better batting side on paper and they are better bowling side,’’ he says. Selector V.B. Chandrasekhar has the last word on the issue, easing the pressure on the boys by saying the team would have other chances even if this opportunity is lost. 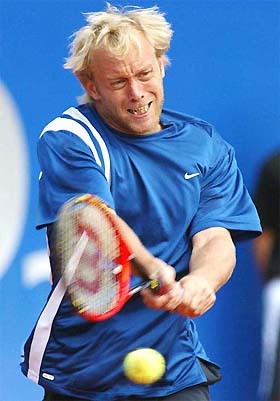 “Having played together successfully till the final, the boys know the importance of this match,’’ he says. Despite his outstanding show in the domestic season, Laxmipathy Balaji knows it will be a tough job to return to the national side that boasts of at least three world-class fast bowlers but the lanky pacer is determined to force his way once again on the sheer basis of his performances. “The team is performing well at the moment and the three fast bowlers Javagal Srinath, Zaheer Khan and Ashish Nehra are doing a fantastic job for the last two years,” said Balaji, whose impressive performance this domestic season has so far fetched him 44 wickets from just six Ranji Trophy matches at an excellent average of 12.77. “I will have to really continue in the same vein to get a berth in the national team,” he told PTI here. Balaji has so far claimed five wickets in an innings seven times so far and in his last innings took 5-49 against Delhi which catapulted Tamil Nadu to the final of the Ranji Trophy championship only for the sixth time. The 21-year old, who has had the opportunity of representing the Indian team in just one-day international against West Indies, said he was not disappointed at being dropped after bowling just four overs at the top level in which he conceded 44 runs. “I have confidence in my abilities and I am looking forward to play again for India again. My performance this season speaks volumes of my potential,” he said. Balaji was overlooked for the Dhaka triseries with the selectors deciding to pick Mumbai youngster Avishkar Salvi after Nehra and Srinath decided to skip the tournament for different reasons. Though Salvi was quite impressive on the tour, Balaji was hoping the selectors would consider his performance while picking the team for the home series against New Zealand in September. “I am quite optimistic about the New Zealand series. I believe I have a fairly good chance of making it to the side,” he said. Though it is yet to be decided how many Test matches New Zealand will play in India, they will feature in a tri-angular series in which Australia are likely to be the third team. Balaji, who idolises Aussie speedster Glenn McGrath, said most of his wickets came because he maintained a disciplined line and length. Balaji now wants to affirm his potential by bowling Tamil Nadu to their second Ranji Trophy title when they meet Mumbai in the final starting on May 5. He also lamented that coaches did not provide the necessary information to the sportsmen about doping and felt it was the responsibility of the coaches to check the menace. Talking to The Tribune at Lawrence School Sanawar near Kasauli Jaspal Rana today said that it was indeed alarming that so many sportsmen were found to have tested positive for doping in the national events. Foreseeing a bright future for shooting he said with increasing facilities available all over the country there was a tremendous scope for the game to progress but lamented that media which paid maximum attention to cricket led to less sponsors coming forward to sponsor the game. Advising the youngsters endeavouring to make it big in the game he said there was no short cut to success and if talent is tapped at an young age it can yield best results. Bishop Cotton School Shimla lifted the overall trophy at the third state inter school shooting chamionship organised at Lawrence School Sanawar today. The event attended by as many as eight schools from all over the state. The host school Lawrence School, Sanawar, ended up as runners-up while Shimla Public School bagged the third position. The rest of the positions were bagged by DAV Public School Shimla, Dalhousie Public School, St Edwards Shimla, respectively. IPS Gill from BCS was adjudged the best boy shooter and Kanika Rana from Dharamsala Public School the best girl shooter. The event was declared closed by Jaspal Rana who gave away prizes to winners. Speaking on the occasion he expressed happiness over hosting the event and said that such meets would help tap talant at an early stage. Other results: .177 peep sight event for boys: 1 IPS Gill (BCS, Shimla), 2 Rhoit A Dejor (BCS Shimla), 3 Raul Mehta (BCS Shimla). .177 peep sight event for sub junior boys: 1 Nirvan Singh (Lawrence School), 2 Rana Karan (Dharamsala Public School),. .177 Open sight event for junior boys: 1 Saranyoo (St Edwards, Manjeet (BCS Shimla) 3 Viren Khullar (BCS). .177 team event: 1 BCS (Shimla) 2 Shimla Public School and DAV Public School (Shimla). .177 Open sight for junior girls: 1 Namrata (DAV Public School, Shimla), 2 Simrith Sidhu (Lawrence School) 3 Niharika (Lawrence School). .177 Air pistol for girls: 1 Kanika Rana (Dharamsala Public School), 2 Shanu Sandhu, 3 Manreet Sandhu (both the host school). Pinegrove School (Subathu), YPS (Mohali) Bishop Cotton School (Shimla) and Lawrence School (Sanawar) boys ensured themselves a berth in the semi-finals of the Ist Major Jagpal Memorial Junior Inter-Public School Basketball Tournament for Boys and Girls after registering well-deserved victories here today. On the second day of the league matches YPS, Mohali, boys beat Shimla Public School 23-05. In the second boys match, Pinegrove School registered 23-18 win against YPS, Padtiala. Ashish Kumar scored 12 points for Pinegrove School and Kashish scored 8 points for YPS, Patiala. Faridkot drubbed Jalandhar by 67-52 on the opening day of the 53rd Punjab State Basketball Championship for junior boys and girls at Police Public School here today. Faridkot in white dress established an early lead from the beginning of the match. At half time Faridkot were leading at 31-26. However, Faridkot maintained the lead and finished winners. Sukhpal Singh accumulated 31 points for the winning side. For losers Sudesh Kumar was the highest scorer with 14 points. Gurdaspur defeated Moga by 34-16, while Muktsar trounced Patiala by 45-38. Vikram Kumar and Mani scored 16 and 11 points, respectively for Muktsar. For the loser Tejpreet and Akshay Kumar made 11 and 8 points respectively. Twenty-six boys and 17 girls have been selected by the Punjab Basketball Association for the coaching camps prior to their participation in the Sub Junior National Basketball Championship scheduled to be held at Nagaon (Assam) from May 16 to 22. According to Mr Teja Singh Dhaliwal, honorary general-secretary of the association, boys will attend the camp at Ludhiana while the girls will undergo coaching at Kotakpura. The names of the campers are: (girls): Lucky, Gurpreet (Jalandhar), Jagroop Kaur (Asr), Veerpal Kaur and Sukhjinder Kaur (Bathinda), Anita (Kapurthala), Harneet Kaur, Aarti Sharma and Aarti Shrama Jr. (all Muktsar), Baksho and Poonam (Hpr), Ekta Sharma, Rajni Bala, Anuradha and Rubel (Gurdaspur) and Anu Preet (Ludhiana). Boys: Ajay Pal Singh, Talwinder Singh and Sukhjit Singh (Mansa), Gagandeep, Jaspal Singh and Jimmy Brar (Bathinda), Amarbeer Singh, Munish and Karanbeer Singh of (Ludhiana), Sunny and Baljit Singh (Muktsar), Agam and Vipan (Jalandhar), Virpal Singh and, Rakesh Puri (Gurdaspur), Beer Karan, Simranjit Singh and Amarpreet Singh (Asr), Mandeep Singh (Faridkot), Harpreet Singh and Vishal Sahota (Kapurthala), Himanshu (Patiala).